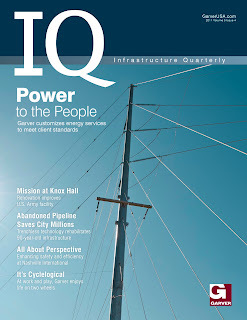 The newest issue of Garver's IQ will hit the streets soon. Power to the People. Garver’s Energy Group is providing generation, transmission, and distribution services designed to client standards. Many clients have energy-related methods, processes, components, and training already in place. When they need to update and expand their aging systems, Garver develops designs that meet today’s standards while satisfying each client’s unique requirements. Mission at Knox Hall. Knox Hall has served Fort Sill, Oklahoma for nearly 70 years. Now home to the U.S. Army Training and Doctrine Command (TRADOC), the two-story building hadn’t been remodeled since an addition in 1962. Garver provided services to redesign the second floor and helped the TRADOC continue its mission. Abandoned Pipeline Saves City Millions. When the City of Okmulgee, Oklahoma needed an economical way to increase its raw water conveyance capacity, it turned to a low-impact, trenchless method that cost $2.1 million less than an estimated open-trench technique. The solution lay with a 90-year-old concrete pipe and a subsurface technology known as sliplining. All About Perspective. Three projects at Nashville International Airport in Tennessee are changing the way pilots, air traffic control, and the aviation industry view the airfield. Garver’s recent projects improved landside and airside lines of sight, reconfigured how taxiways interact, and installed airside synthetic turf. It's Cyclelogical. Garver’s commitment to bicycle advocacy is fueled by employee passions. Through athletic example and engineering design, Garver is encouraging communities and individuals to stay fit and have fun on two wheels. Moreover, Garver’s “cyclelogical” attitude reflects the public’s growing trend to settle in communities with bicycle-friendly infrastructure. You can read our newsletter and past issues on the Garver Website.